Present state: Some small sections of platform and a goods office extant. Notes: Llanymynech was situated on the Cambrian Railway (CR) main line that linked Whitchurch and Aberystwyth. The section of line on which Llanymynech stood was authorised as part of the Oswestry & Newtown Railway (O&NR) on 26 June 1855 and work began on it on 4 August 1857. By 1860 the section of line between Oswestry and Pool Quay was almost complete. It was inspected on 18 April 1860 by Colonel Yolland who recommended some modifications. The modifications were carried out and the line opened between Oswestry and Pool Quay on 1 May 1860. Llanymynech station was located to the east of the village whose name it carried. Interestingly, the village is in Wales but the station was actually over the border in Shropshire. The station stood on the north side of the Llanymynech – Maesbrook road (the present day B4398) which crossed over the line on a bridge. Access to the station was via a driveway that connected to the road on the western side of the line. The line was single track but enough space was available for future doubling. The platform was on the west side of the line and facilities at the time of opening were described in company minutes as ‘temporary’. Goods facilities were provided at the station in the form of sidings, also on the west side of the line. The O&NR operated four trains in each direction on Monday-to-Saturday and two on Sunday. An omnibus operated between Pool Quay and Welshpool, a distance of just over four miles. The trains were based at Oswestry where there were facilities for servicing them. By August 1860 the line between Pool Quay and Welshpool had been completed and it was inspected and passed for use by Colonel Yolland on 4 August 1860. Regular services between Oswestry and Welshpool began on 14 August 1860. On 11 July 1863 the O&NR opened an 8½-mile branch line from Llanymynech to Llanfyllin. The branch was provided with its own bay platform at Llanymynech at the north end of the station, west of the line. An engine shed was also provided towards the south end of the goods yard for the branch line locomotive. The Llanfyllin branch had its junction with the main line 15 chains north of the station and it faced northwards. Branch line trains, therefore, had to be propelled from the bay platform northwards to the junction. The train would then reverse and the locomotive could haul it to Llanfyllin. The move had to be performed in reverse for arriving branch line trains. During the second half on 1863 work began on doubling the line between Oswestry and Llanymynech. The works were inspected on 13 February 1864 by Colonel Tyler. The Colonel reported that a second platform had been added at Llanymynech that was ‘devoid of any shelter’. The double-track works were passed for use on 15 February 1864. The double track extended through the station and passed under the Llanymynech – Maesbrook road and became single 8 chains to its south. A signal box located on the east side of the line controlled the point at which the line became single. A permanent station building was added around this time. It was located on what had become the up (Oswestry direction) platform. The building was at the southern end of the platform close to the road overbridge. It was a modest timber-built pitched-roofed structure with a flat awning, decorated with a serrated valance. A further single-storey, hipped-roofed building stood to the north, set back a little from the platform. The goods yard was also developed, with further loading ramps and a lifting crane being provided. On 25 July 1864 the O&NR merged with the Llanidloes & Newtown Railway, the Oswestry, Ellesmere & Whitchurch Railway and the Newtown & Machynlleth Railway to form the CR (which also absorbed the Aberystwyth & Welch Coast Railway [sic] in 1865). The merger of the companies created the through route between Aberystwyth and Whitchurch. 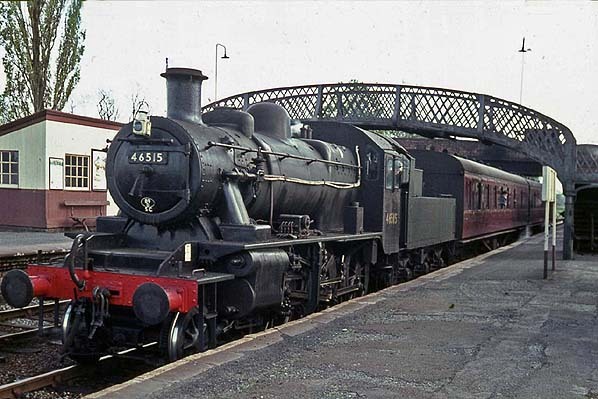 The CR operated long-distance and local passenger trains through Llanymynech, most of which called at the station. On 13 August 1866 Llanymynech gained another two platforms. They were located to the east of the existing station and served the Potteries, Shrewsbury & North Wales Railway (PS&NWR) which opened a double-track line from Shrewsbury and a single-track 3¾-mile branch from Llanymynech to Nantmawr. The PS&NWR facilities at Llanymynech included a pent-roofed structure with a very narrow awning fronted by a deep valance. This building contained the ticket office and waiting room and stood on their down platform (the easternmost). The PS&NWR up platform was an east face of the CR down platform which, in effect, became an island. 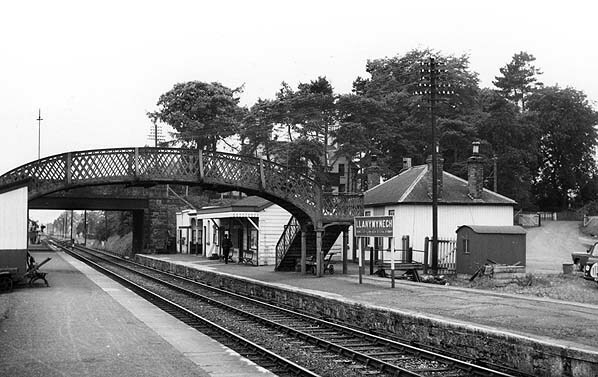 The CR provided a timber waiting shelter on the island platform and a footbridge was constructed over their main line. The PS&NWR platforms curved towards the east at their northern end and to the west of their main line. To the east of the CR main line they had sidings, an engine shed with turntable and a water tank. To the south of the station the PS&NWR Shrewsbury line had a junction with the CR main line, and immediately to the south of that the Nantmawr branch diverged. curving west. Over the short section of line between the two junctions the PS&NWR had running rights so that it could reach the Nantmawr branch. At the time of opening the PS&NWR operated five trains each way between Shrewsbury and Llanymynech on Monday-to-Saturday and two each way on Sunday. The line was not a success and it went into receivership and all train services ceased on 21 December 1866. The line was singled and many of its assets, including locomotives, were sold off. Train services restarted in December 1868 with three passenger trains in each direction on Monday-to-Friday, four on Saturday and one on Sunday. On 18 April 1870 the PS&NWR started a passenger service on the Nantmawr branch. The trains ran 2½ miles to a station at Llanyblodwell. The PS&NWR receivers were not able to make their lines pay and they ceased to operate trains on 22 June 1880. The company was wound up on 18 July 1881 and the Shrewsbury line fell into dereliction. The Nantmawr branch continued to be used for mineral trains which were operated by the CR. During the 1880s the Llanfyllin branch became very busy because of the construction of the Vyrnwy Reservoir by Liverpool Corporation. Not only did thousands of tons of material travel over the line but extra passenger services were run. On the main line the December 1895 timetable showed 8 up and 4 down trains Monday-to-Saturday. On Wednesdays there was an extra train in each direction. Two of the up trains started their journey at Llanymynech and 2 of the down trains, from Oswestry, terminated at Llanymynech. On Sundays there was 1 train in each direction. Serving the Llanfyllin branch (see timetable below) there were 4 trains in each direction Monday, Tuesday, Wednesday, Friday and Saturday. On Thursdays there were 5 trains each way. By the 1890s the Nantmawr branch had fallen out of use but it was to find a new role on 27 January 1896 when a half-mile curve was opened linking it to the Llanfyllin branch. The curve diverged from the Nantmawr branch from a point 61 chains to the west of Llanymynech station at what became Nantmawr Junction (later changed to Llanfyllin Branch Junction). The purpose of the curve was to allow Llanfyllin branch passenger trains to run into and out of Llanymynech station without having to perform the reverse moves. With the opening of the curve the original line was converted into the Rock Siding (68 chains in length). After the opening of the curve the bay platform became little used by passenger trains. From 6 January 1904 passenger workings recommenced between Llanymynech and Llanyblodwell which had reopened as Blodwell Junction as part of the Tanat Valley Light Railway (TVLR). The TVLR was a 13¼-mile line that ran from Llynclys Junction on the CR (two miles to the north of Llanymynech) to Llangynog. The TVLR made use of a ¼-mile section of the Nantmawr branch at the Blodwell Junction station site. 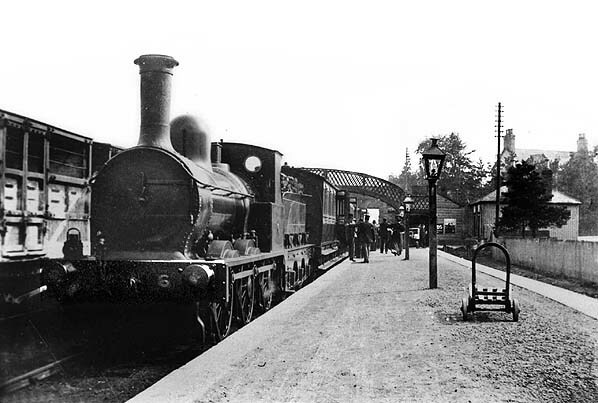 Most TVLR trains ran between Oswestry and Lllangynog via Llynclys Junction bypassing Llanymynech, but moves were afoot to resurrect the PS&NWR as the Shropshire & Montgomeryshire Light Railway Company (S&MLR) and that company wanted a Llanymynech connection. For that reason some passenger trains were run in the form of coaches attached to goods trains. The S&MLR did not obtain its Light Railway Order until 11 February 1909, after which reconstruction started on the moribund line. It reopened on 13 April 1911 when a special train was run from Shrewsbury Abbey to Llanymynech and return. Four trains were then operated each way on Mondays-to-Saturday with two on Sunday. On 1 January 1917 the passenger services between Llanymynech and Blodwell Junction ceased. In 1925 the section of the Nantmawr branch between Nantmawr Junction and Blodwell Junction was closed and lifted. The GWR made improvements to the CR main line which speeded up journey times. From February 1933 there was only one passenger train in each direction on the S&MLR on Monday-to-Friday and two on Saturday. The service ended on 6 November 1933. In 1939 the Rock Siding closed and was lifted. When Britain joined the Second World War on 3 September 1939 the fortunes of the S&MLR line were reversed. The War Department saw the sparsely populated countryside along the route of the line the ideal location for a vast ordnance depot. They requisitioned the S&MLR main line and immediately put it into good order. At Llanymynech a marshalling yard was laid out adjacent to the line to the north-east of the station. Traffic became very heavy and passenger trains for military personnel were run. In 1947 the S&MLR reverted to civilian status. Llanymynech became part of British Railways [Western Region] (BR[WR]) at nationalisation on 1 January 1948. The S&MLR passed to joint BR[WR] and War Department ownership. The summer timetable for 1949 showed Llanymynech as having 12 trains in each direction on Monday-to-Friday. 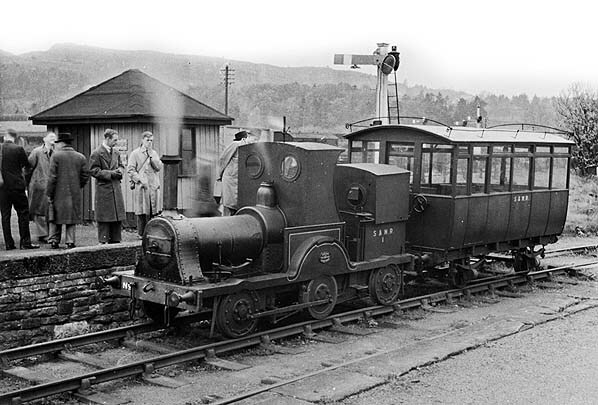 Some of the services were Llanfyllin branch line trains that started from or terminated at the station. On Saturday there was an extra up train that terminated at Llanymynech having originated from Llanfyllin. On Sunday there was one train in each direction. By the September 1955 there were 8 up and 8 down trains on the main line Monday-to-Friday. On Stardays there was 1 less down train. On Sundays there was one train in each direction. There were 4 Llanfyllin branch trains each way Monday-to-Friday and 5 on Saturdays. Three of the down direction Llanfyllin trains originated from, and 3 of the up trains ran to Oswestry. This meant that to the north of Llanymynech there were an extra 3 trains each way over the main line giving a total of 11 Monday-to-Friday. On 20 March 1960 a rail tour was run from Shrewsbury Abbey to Llanymynech over the S&MLR. It was the last passenger train to use the route which closed shortly after. The line was lifted in 1963/64. On 1 January 1963 Llanymynech passed to the operational control of British Railways [London Midland Region] (BR[LMR]). Three months later the Reshaping of British Railways report (the ‘Beeching Report’) was published. It recommended that the line from Buttington Junction to Whitchurch, and the branch to Llanfyllin should lose their passenger service, and the intention was that the line should close completely between Buttington and Llynclys (including the Llanfyllin branch). 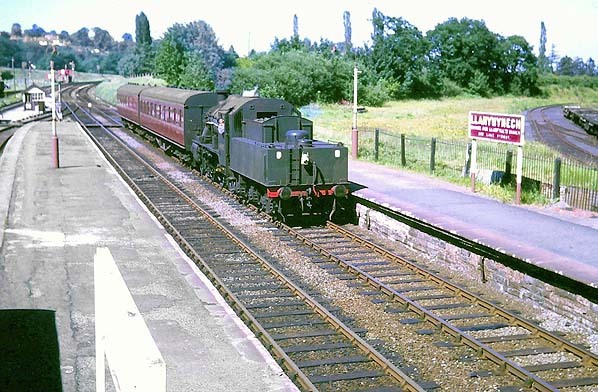 On 6 July 1964 Llanymynech closed to goods. The 7 September 1964 timetable showed 10 up and 11 down trains on Monday-to-Friday. On Saturday there were an extra two down services; on Sunday one train ran in each direction. The last trains ran to and from Llanymynech on Saturday 16 January 1965 and on Monday 18 January the line through the station, between Buttington and Llynclys closed completely; track-lifting followed later in the year. Although the main buildings and down platform waiting shelter were demolished shortly after closure the platforms survived until the mid 1970s when the site was taken over by a haulage company. In 2010 the S&MLR side of the station was developed with housing. In 2015 the CR side of the station was derelict and overgrown. A goods office building was still standing. Llanymynech station lokking south along the up platform in 1904. A train has just arrived and passengers can be seen boarding. To the right is the bay platform that had been used by Llanfyllin branch trains until 27 January 1896. Llanymynech station shown on a six-inch scale map from 1874. Llanymynech station shown on a 1:2,500 scale map from 1900. Llanymynech station shown on a six-inch scale map from 1901. Llanymynech station shown on a Railway Clearing House map from 1915. The Cambrian Railway lines are shown coloured purple. 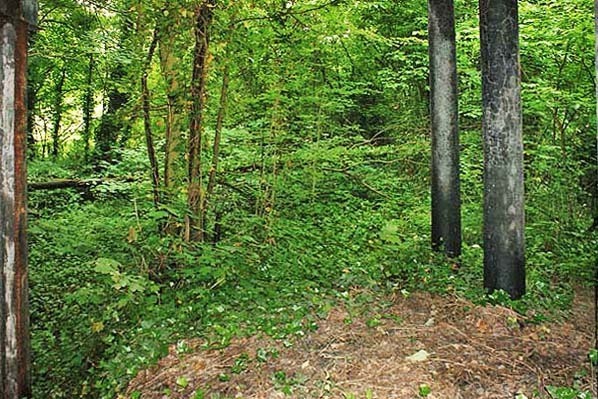 The Shropshire & Montgomeryshire Light Railway is black and the Nantmawr branch is green.The Rock Siding line had once been part of the Llanfyllin branch but after the opening of the junction with the Nantmawr branch on 27 January 1896 it was cut back. Passenger trains from Llanymynech were able to travel to and from Llanfyllin without having to perform a reverse move once the junction had opened. 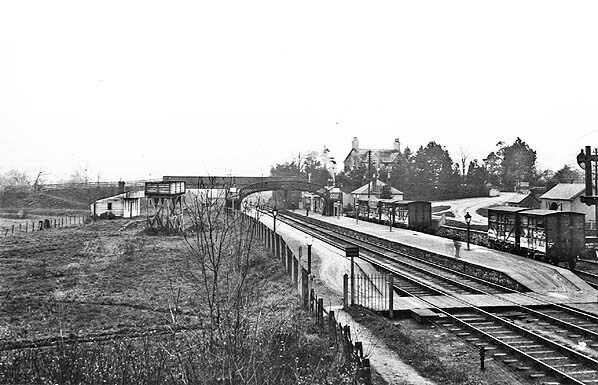 A view looking south at Llanymynech station in 1904. The derelict platforms of the Potteries, Shrewsbury & North Wales Railway can be seen to the left. A view of Llanymynech station seen looking north from the road overbridge in the 1920s. The S&MLR platforms and station building can be seen to the right. 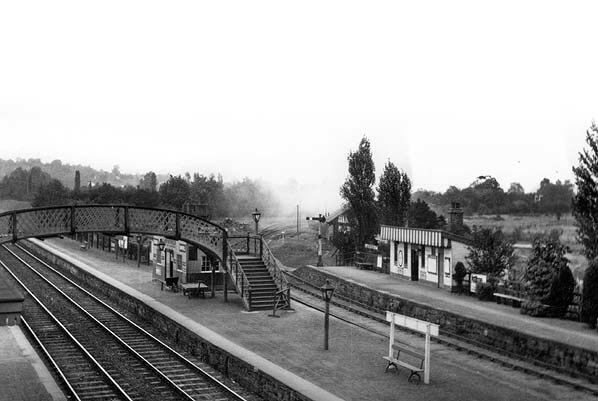 Llanymynech station looking south along the down platform in September 1962. Looking south along the up platform at Llanymynech in May 1963 as a local service for Oswestry waits to pull away. A local train is seen ariving at the Llanymynech down platform on 20 July 1963. Looking north along the down platform at Llanymynech station on 28 June 2013 from underneath the road overbridge. The Cambrian Railway main line was to the left.